"Brute." "Cockroach." "Lice." "Vermin." People often regard members of their own kind as less than human, and use terms like these for those whom they wish to harm, enslave, or exterminate. Dehumanization has made atrocities like the Holocaust, the genocide in Rwanda, and the slave trade possible. But it isn't just a relic of the past. We still find it in war, genocide, xenophobia, and racism. Smith shows that it is a dangerous mistake to think of dehumanization as the exclusive preserve of Nazis, communists, terrorists, Jews, Palestinians, or any other monster of the moment. We are all potential dehumanizers, just as we are all potential objects of dehumanization. The problem of dehumanization is everyone's problem. 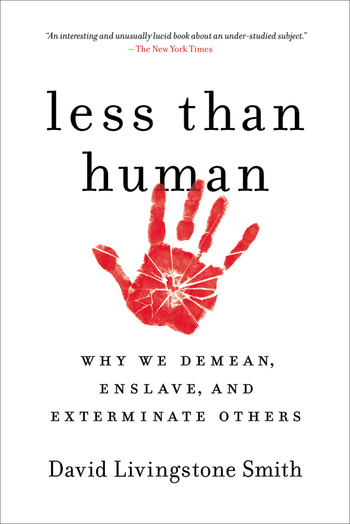 Less Than Human is the first book to illuminate precisely how and why we sometimes think of others as subhuman creatures. It draws on a rich mix of history, evolutionary psychology, biology, anthropology, and philosophy to document the pervasiveness of dehumanization, describe its forms, and explain why we so often resort to it. Less Than Human is a powerful and highly original study of the roots of human violence and bigotry, and it as timely as it is relevant. “Dehumanization is a thoroughly human behavior. It is a tool we have used for millennia to bolster our self-esteem, to justify slavery and exploitation, to get ourselves to kill and exterminate. Yet, despite its terrible significance, surprisingly little scholarly attention has been trained on the phenomenon -- on its origins, how it works, and how we might avoid its dreadful toll. Bringing enviably acute skills as a philosopher to bear on the subject, David Livingstone Smith draws on an impressive range of sources to argue that dehumanization emerges from the very core of our humanity, our ability to reflect upon our own thoughts. Writing in an engaging and accessible style, he uses an incisive logic to pare away the layers of his subject to reveal this troubling conclusion. This is an important book for anthropologists, who are interested in ethnocentrism, and for any human concerned about our capacity to harm one another.” —Paul Roscoe, Ph.D., Professor of Anthropology, University of Maine. Dr. David Livingstone Smith is a professor of philosophy and founding director of The Human Nature Project at the University of New England. He is the author of Why We Lie and The Most Dangerous Animal and lives in Portland, Maine.